The tailor Nick Holland has opened a pop-up shop at WREN, in Lamb's Conduit Street, to showcase some of his favourite discoveries, together with some of his own items of tailoring. It's only on until 17th November, so visit while you can. "Renowned tailor Nick Holland has taken up residence at WREN (Lamb's Conduit Street, Holborn) bringing with him an extensive collection of curiositys and exquisite tailoring. Holland Esquire is one of the finest tailoring companies in the UK, specialising in seasonally updated modern tweeds and eclectic mix-ups of unique fabrics. Their signature designs feature hand stitched customisation, crafted themed buttons and bright limited edition contrasting jacket linings. 'Here are a few of my favourite things' is a combination of Nick Hollands vast collection of wonderful rare objects and his eye for tailoring perfection. The environment in which the limited edition range resides reflects themes and stories within the suiting. Five of the jackets are exclusive to the pop-up and come with a unique gift in every pocket. The Allotment Lover sports fruit & veg buttons and comes complete with packets of seeds and a jar of honey. The Bird jacket comes with a duck-call and a hand crafted ceramic birds egg, showcasing Nicks acute attention to detail. 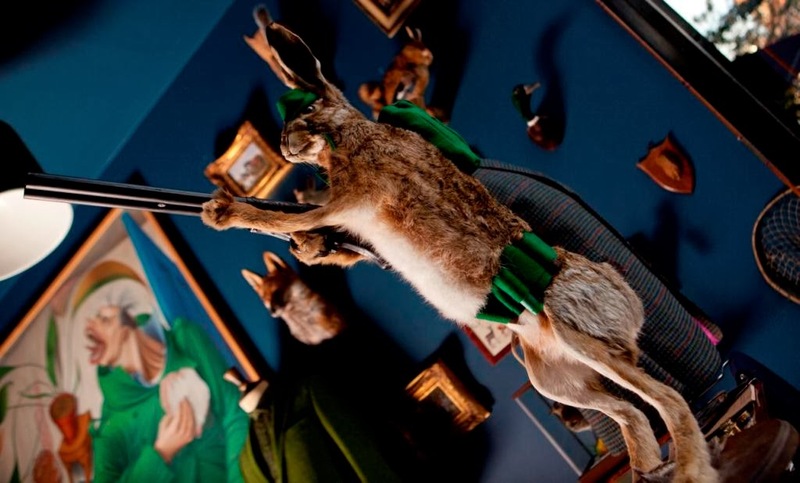 Again, the Game keeper turned Poacher jacket is showcased next to a stuffed fluffy hare armed with a shotgun, creating a quirky visual story to every window shopper that passes by. Truly a shop to be experienced and seen"